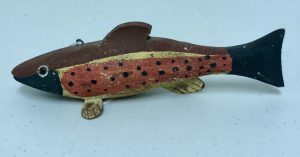 Well used 8″ long Pike Spearing Decoy with a nicely carved wood body, tin fins , painted and carved eyes. The features are in good, used, worn condition. One side fin has been replaced with period tin and two original side fins have been strengthened with an inset tin flange. 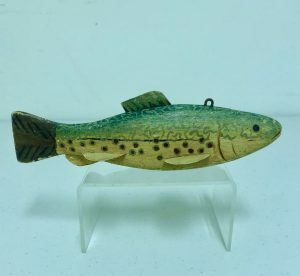 Nicely carved and paint decorated later spearing decoy, 6″ long. Well carved facial features, rear fin and curved tail. Signed “D. Hawthorne”. Carving and painting creates a nice personality feature. Excellent original condition. 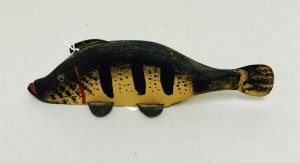 A great looking 8″ Speckled Trout Spearing Decoy. The gills are deeply carved and mouth is open. 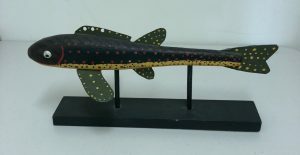 The condition is excellent and original with lots of hand painted details on the body and the fins. 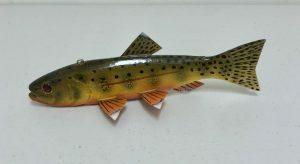 Exceptional 6 1/2″ decorated Trout Ice Fishing Spearing Decoy. Wonderful hand painted flower and vine details. Excellent used condition. A very nice artistic and refined example.